Glovers Cottage near Llanrhystud, Cardigan sleeps 3 people. Glovers Cottage near Llanrhystud, part of the 65-acre Fynnon Hywel Farm, is without doubt something unique. As you enter you will be struck by the space and the overwhelming character of this detached building. 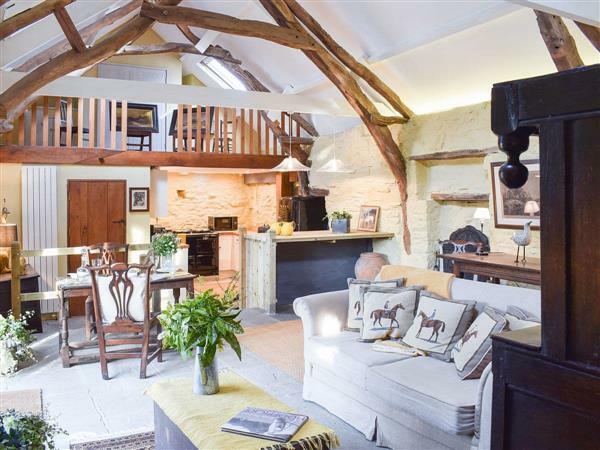 The owner has deliberately left the barn open-plan for guests to appreciate the huge A-frame beams and stonework. A feature handmade bed sits on the first level as you enter, and this area leads down two steps to the flagstone floored living and dining room, with the option of a breakfast bar or separate table to dine at. Two further steps down bring you into the well-equipped kitchen and the bathroom. French doors lead out to the enclosed courtyard where you’ll find a hot tub. University of Wales Agrarian Historian, Professor Richard Moore Colyerm, has kindly provided background to the farm. The small complex of buildings on the Ffynon Hywel site comprise a farm settlement which appears to date from the late 13th century and, indeed, may lay upon the foundations of an even earlier site. On a hilltop a mile or so to the west are the earthworks which represent the remains of the 11th-century castle of Llanrhystud, which played an important role in the various wars between the belligerent Welsh princes, before it was eventually fortified by Roger, Earl of Clare in 1158. Today a series of grassy banks and ditches, the remains offer wonderful panoramic views of the great sweep of Cardigan Bay. Ffynon Hywel (Hywel’s Spring/Well) marks the location of one of the 200 or more identifiable “holy wells” of Wales. In this respect the place would have been familiar to the many pilgrims en route to the great Cistercian Abbey of Strata Florida, in addition to being locally celebrated for the healing properties of its waters. Originally part of the Mabws Hall Estate, Ffynon Hywel is located close to the original lane leading to the hall itself. The lane is available to walkers who might wish to enjoy the tranquillity of the local pastoral landscape and the quiet splendour of its woods and rippling streams. Ffynon Hywel Barn, as the name implies, was a key component of the economy of the site for several centuries. Of scarved cruck and rubble wall construction, it has probably had many functions over that period in accordance with the changing nature of local farming practice. Over the past couple of centuries it will have served as a threshing barn, and original features relating both to threshing and winnowing can still be detected. It is a wonderfully atmospheric building and after a glass or two of wine it is only too easy to imagine the ’twack’ of the hand-held flails on the threshing floor as the labourers set about their dusty and sweaty task! Now exactingly restored by the present owner, the barn offers an ideal base for those keen to explore the rich heritage and unequalled countryside of this part of the ancient kingdom of Ceredigion. Fifteen minutes away you can visit Aberystwyth, where there’s an array of shops, restaurants and cafés, as well as the pier and promenade. Take part in the long standing tradition of walking the length of the promenade and ’kicking the bar’ at the end! There are several theories as to how this tradition began, but once you reach the north end of the seafront you will see the Victorian Cliff Railway taking passengers on the stately journey to the summit of Constitution Hill, where you can have a snack whilst taking in the magnificent views of Cardigan Bay stretched out in front of you. Being a university town, there’s a very good arts centre and theatre, and the National Library of Wales offers free guided tours. If it’s beaches you’re after, Ceredigion has a stunning selection and over 60 miles of coastal path too. Living area: With electric wood burner, Freeview TV, single sofa bed (for flexible sleeping arrangements) and French doors leading to courtyard. Kitchen area: With breakfast bar, electric Aga, microwave, fridge/freezer, dishwasher and washing machine. Bedroom area: With super king-size bed. Oil central heating, electricity, bed linen, towels and Wi-Fi included. Welcome pack. Enclosed courtyard with sitting-out area and garden furniture. Hot tub for 4 (private). Private parking for 2 cars. No smoking. Holidays at Glovers Cottage run from Monday to Monday. Pets allowed at Glovers Cottage. For a better idea of where Glovers Cottage is, you can see Glovers Cottage on the map below. Glovers Cottage is in Dyfed; should you be on the lookout for a special offer, you can find all the special offers in Dyfed. It's always worth checking to see what is on offer at the moment. Do you want to holiday near Glovers Cottage (UK10401), you can see other cottages within 25 miles of Glovers Cottage; have a look to find your perfect holiday location.